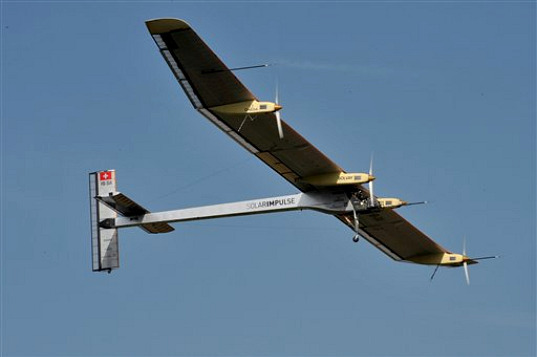 Solar Impulse Plane Takes First Successful Flight! After seven years in the making, the Solar Impulse made its first real flight this morning from an airbase in Switzerland. The solar-powered plane got up to 5,500 ft in altitude and performed test maneuvers in order to see if the plane handled as well as simulations predicted. Everything went perfectly for the first test flight and proved that the plane is capable of taking off and landing. 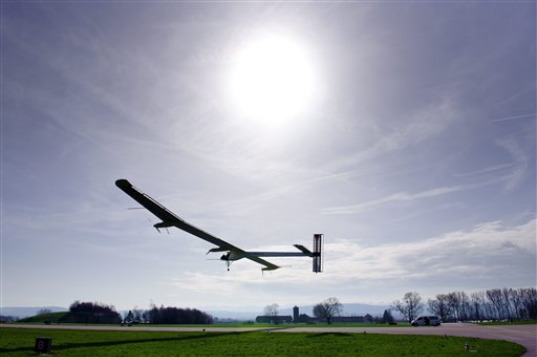 With this important test flight behind them, the Solar Impulse team can push on towards gearing up for their solar powered around-the-world flight in 2012. The Solar Impulse prototype has a wingspan of over 60 meters, close in size to that of a Boeing 747, but weighs about as much as a small car. About 12,000 solar cells cover the tops of the wings to generate power for the 40 hp engine, with an average speed of 70 kph (44 mph). During the test flight, the Solar Impulse flew for 87 minutes and performed a series of turns, slip maneuvers and bank angles reaching 5 degrees as well as a successful take off and landing. 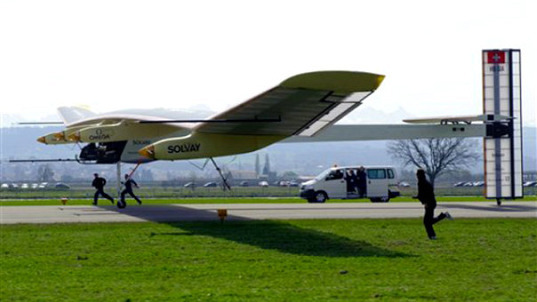 Marcus Scherdel, the plane’s pilot, said after the flight, “Despite its immense size and feather weight, the aircraft’s controllability matches our expectations.” In December, the Solar Impulse started making controlled hops about 3 feet off the ground to test out the plane, but today was the first real flight. Now that it has proven itself the team can work easier in preparation for their journey around the world. Andre Borschberg, co-pilot and CEO and co-founder of the project, said, “Never has an airplane as large and light flown before!” and that the success of the first flight “allows us to envisage the further programme with greater serenity.” The team is aiming for 2012 for the around the world flight, in which the solar powered plane will fly during both the day and night without fuel. Next up though is a 36 hour flight to test the plane during the night. Is it flying off of battery power alrady stored from the solar cells or do the solar cells sustain flight? This is pretty cool if real time solar can provide all of the power. Application: satellite replacement, high altitude automatic solar planes run 24/7. Run on batteries at night while gliding down a little. These planes would land only for service. Compared to satellites these would be a lot less expensive and would not require any pollution for their launch.